QNAP TVS-951X 9-Bay NAS with 7th Gen Intel Celeron 3865U 1.8Ghz Dual Core, Intel® HD Graphics 610 – transcoding engine, 2-16GB Memory, 10GbE NBASE-T LAN, 1GbE LAN RJ45, 3+1 USB 3 ports, Quick Copy Button, Rear Speaker, Audio Out and 5 x 3.5″ and 4 x 2.5″ drive slots. Software: Plex Media Server Support, 30x Cameras in Surveillance Station, VM use with Virtualization Station, Container Station, Linux Station and Windows Server Support and more with full app support on QTS 4.3.4 operating software. Desktop form factor with every real estate used economically and designed with performance and a value proposition that will appeal to all users, this can easily be classified as a NAS for masses. Quality case manufactured to sustain the environment and extreme data usage but still oozes style and gives an air of confidence for the buyer’s investment. As SSD prices continue to fall (unlike our wretched gas prices), creating a complete SSD set is still beyond many users – especially if higher capacity storage is required. The TVS-951X provides the ability to use a hybrid storage structure that leverages the benefit of both hard drives and SSD to provide high storage capacity and performance. You can flexibly allocate applications to SSDs, or setup a SSD cache, or automate using Qtier technology to automatically tier your frequently accessed files to the SSD for the highest access speeds. 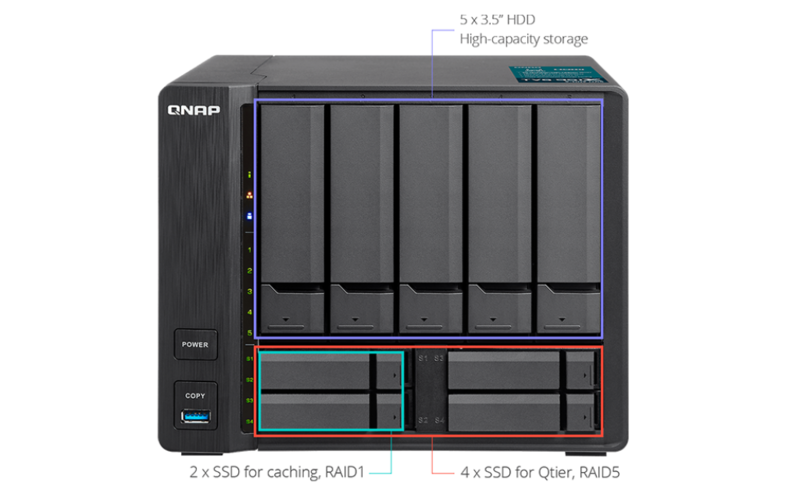 These features form a part and parcel of the QNAP TVS-951X allowing optimization of storage utilization. Cold Storage – In the TVS-951X the cold will be the SATA hard disk drives that are selected hot swappable ranging from 1TB upwards to 14TB drives. If you have a lot of data that needs access all the time, then we suggest you look at having more “hot” storage i.e. SSD’s. Now this scenario is where things get very interesting the combination of Cold storage with Hot storage occurs when the use of SSD’s are introduced ranging from 250GB up to 4TB currently we are talking about 4TB being around $1k mark which is still expensive. TS-951X is a 10GbE pre-installed NAS – 1 x RJ45 10GBASE-T, supporting 10G/5G/2.5G/1G/100M speeds. Note: Please use Cat 6a or Cat 7 LAN cables (optional purchase) to achieve 10GbE speed over longer distance. The disappointment is in the 1 x 1GbE RJ45 availability, the 3 x USB 3.0 with one at the front for one touch copy is now a QNAP trademark. 1 x HDMI v1.4b, up to 4096 x 2304, 24 Hz, all in all not bad at all really. The TVS-951X is suited and booted for all both home and business users will appreciate the holistic nature of the NAS and the Hybrid design is a definite plus allowing for many of the features provided by QNAP. Protect data with Snapshots – this is a feature we think is excellent for any business or for that matter any user. Snapshots can be used to protect entire data on a NAS at the point in time including metadata, if a file is accidentally deleted or modified you can roll back the snapshot and restore the file to its previously-recorded state. The YVS-951X supports up to 256 snapshots per volume/LUN, and up to 1,024 snapshots in total. NOTE: Make sure you buy enough storage to facilitate snapshots. NAS as a Multi-OS Platform – Virtualization Station and Container Station provide comprehensive solutions for creating virtualized environments to improve business IT infrastructure, workflows and productivity. TVS-951X is ideally suited for businesses and home at a price commencing from for diskless TVS-951X-2G-US – $660 and TVS-951X-8G-US – $849 this is not bad for a Hybrid NAS. 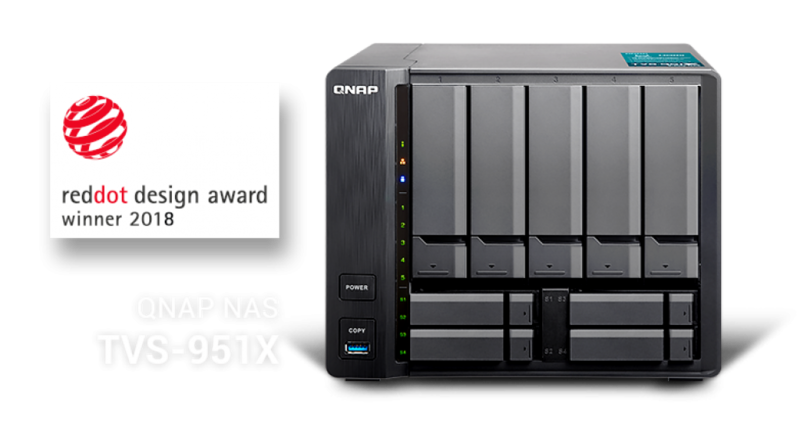 QNAP TVS-951X-2G Diskless 9 Bay NAS. Intel Celeron 3865U dual-core 1.8 GHz processor, 2 GB RAM (1 x 2 GB) with 10GbE connectivity for multimedia applications.